Infectious bronchitis (IB) is one of the most common viral diseases in chicken production worldwide and IB virus (IBV) is considered the most contagious poultry pathogen. Its economical importance requires continuous monitoring and accurate diagnosis in order to minimize losses in chicken production. Laboratory confirmation of the IBV infection is required for proper diagnosis due to similar symptoms caused by many other poultry pathogens and conditions. Monitoring of IBV means regular periodic laboratory testing of chicken flocks even in absence of suspicion to field infection. Such approach provides foundation for accurate and timely diagnosis in cases of current and future field infections. Depending on the causative field virus and immunity of the birds, field infection does not necessarily cause typical or obvious or sometimes any symptoms, especially in chickens at age from 6 weeks to the onset of lay. Unnoticed or unrecognized infections may result in breeding of false layers and/or in further spread of the field virus by moving of infected birds to another farm e.g. by male spiking in breeding flocks. 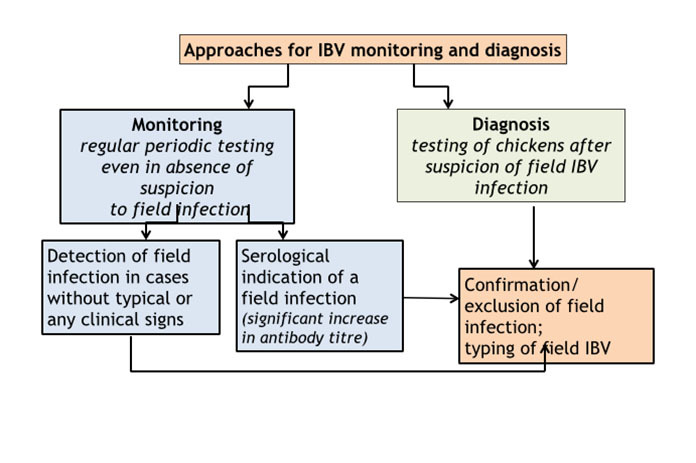 Diagnosis of IBV means laboratory testing of chickens after suspicion of a field infection based either on results of the serological monitoring or on emergence of problems in production, clinical signs and gross lesions. Detection of field IBV infection should be followed by at least partial antigenic and/or genetic analysis of the virus. Such data can then be used for designing/adjusting of local or regional IBV vaccination programmes. Testing frequency and particularly sample size in respect to flock size, infection prevalence, test sensitivity and confidence level have been discussed and reviewed in scientific and technical publications. Generally, more frequent testing and larger samples size give higher certainty for field IBV detection, but the larger sample size also increases risk of false positive results and costs. Here is suggested a scheme for monitoring of IBV circulation and estimating its prevalence for standard chicken farms in the intensive poultry industry. It is based on the author’s experience that takes into account compromise between the above mentioned factors for high certainty of field IBV detection and considerable costs of such testing. Same sampling scheme and serology testing are used for assessment of post-vaccinal immunity and for serological monitoring of IBV. 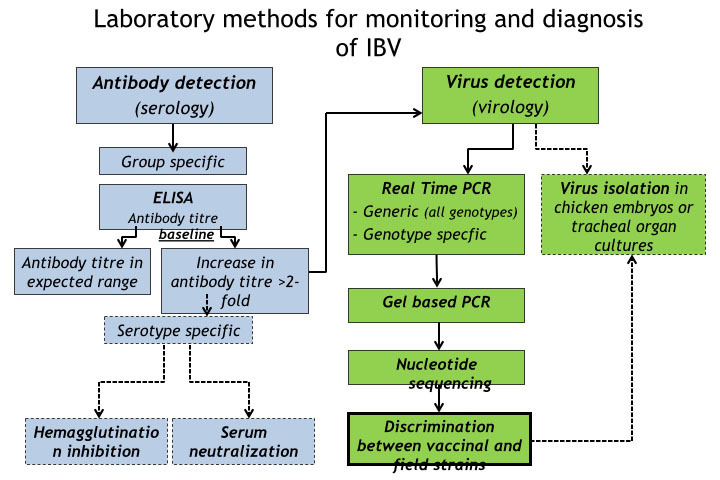 The aim of such sampling scheme and testing is the establisHment of IBV antibody titre baseline and monitoring of any deviation in expected antibody titres. Once the titre baseline is established, finding of lower titres indicate poor serological response to vaccination while higher titres suggest field infection in the flock. The sampling scheme depends on the local IBV vaccination programs. It should be as much as possible identical for each subsequent flock and should be adjusted if change in the IBV vaccination program occurs. Breeders and layers should be serologically tested at least twice during the rearing period and preferably every 8 weeks during production. Blood samples are usually taken 3 to 4 weeks after administration of live IBV vaccine and 4 to 8 weeks after administration of inactivated IBV vaccine. Due to the short life cycle of broilers, they are usually sampled at the end of the production cycle either at the farm or in the abattoir. Each broiler farm should be serologically tested at least once a year. At least 20 random blood samples per poultry house should be taken. If a farm consists of three or more closely situated poultry houses with birds of the same type, origin, age, management and vaccination program, it is acceptable to test chickens only in representative poultry houses. These poultry houses should not represent less than 40% of total number of the poultry houses at the farm. Representative poultry houses should be also selected on basis of their arrangement within the farm, proximity of neighbouring farms, direction of dominant winds, IBV history at the farm, etc. Sampling from the same representative houses should be conducted for the entire production cycle. Even if there is no possibility to regularly analyse samples from each blood sampling, the sera should be stored in freezer and tested retrospectively together with current samples if suspicion of IBV occurs. ELISA is commonly used for routine testing for IBV antibodies and many commercial kits are available. ELISA’s are group specific and cannot distinguish antibodies from different types of IBV. Same type of ELISA kit should be used all the time since different types of ELISA kits give different titre values for the same sample. If different ELISA kits are used for testing of the same flocks, historical results will have no value for interpretation of current results. Once the titre baselines have been established, unusually high (> twofold higher) antibody titres will suggest the occurrence of a field infection in the flock. Such sera can be tested by serum neutralisation (SN) or haemagglutination inhibition (HI) in an attempt to determine serotype of the causative field IBV. SN and HI tests can be performed only in specialized laboratories. SN test is more expensive and time consuming but provides more confidence than HI test. The interpretation of SN and HI is not always straightforward due to limited number of IBV antigens used in the tests and relatively high level of cross reactions in vaccinated birds that have been in contact with multiple serotypes of IBV, particularly if adjuvanted inactivated IBV vaccines were used. In case of any serological suspicion of field infection, fresh samples for virus detection should be taken as soon as possible from preferably all poultry houses at the farm. It should be kept in mind that live vaccinal viruses can spread horizontally to non-vaccinated chickens, especially if the non-vaccinated chickens are kept in proximity of chicken farms where IBV vaccination is routinely practiced. Detecting of seroconversion in such cases does not necessarily confirm field infection. The sampling scheme for virus detection in absence of a suspicion of field infection (i.e. monitoring) should be also designed in accordance with the vaccination programme. This means that samples should not be taken soon after administration of IBV live vaccine, but rather as soon as possible prior to vaccination in order to avoid high load of live vaccinal virus in tested samples. Layer and breeder flocks should be sampled at least once during the rearing period and at least once during the production period. Sampling in the rearing period should be aimed at age between 8 and 16 weeks because IBV infection at this age usually does not cause clinical symptoms and therefore may remain unnoticed. Many chicken producers move pullets (replacements) from rearing farms to production farms at age of 16 to 18 weeks which is another reason to test birds at the suggested age. Adult layers and breeders should be monitored for IBV infection in the second half of the production period because specific immunity, as well as eggshell quality, declines towards the end of production. This common decline in eggshell quality can mask or can be confused with eggshell abnormalities caused by IBV infection. Broilers are normally sampled at the end of the production cycle either at the farm or in the abattoir. Mild respiratory symptoms are not unusual in broiler flocks. They are frequently caused by, and attributed to, environmental factors (e.g. ammonia build-up, draughts, excessive dust, etc) and/or vaccinal reactions. These non-specific symptoms can mask or can be confused with mild forms of IBV infection particularly in IBV immune broilers. In order to monitor IBV circulation, each broiler farm should be therefore tested for field virus presence at least once a year, preferably during the colder part of the year. At least 10 pharyngeal/tracheal and 10 cloacal swabs from randomly selected birds per poultry house should be taken. If farm consists of three or more closely situated poultry houses with birds of the same type, origin, age, management and vaccination program, it is acceptable to test chickens only in representative poultry houses as described above for the blood sampling. For testing, up to 5 swabs from the same house and from the same organ sampling can be pooled in the laboratory. In cases of suspicion of clinical IBV infection, fresh samples should be taken from affected poultry houses as soon as possible regardless the suggested sampling scheme. If possible, in such cases fresh carcasses should be sampled instead of swabbing. Organs from at least five dead birds per affected poultry house should be sampled. Tracheas and kidneys should be preferred in cases of acute IBV infection and kidneys, caecal tonsils and cloaca in cases if chronic infection is suspected. 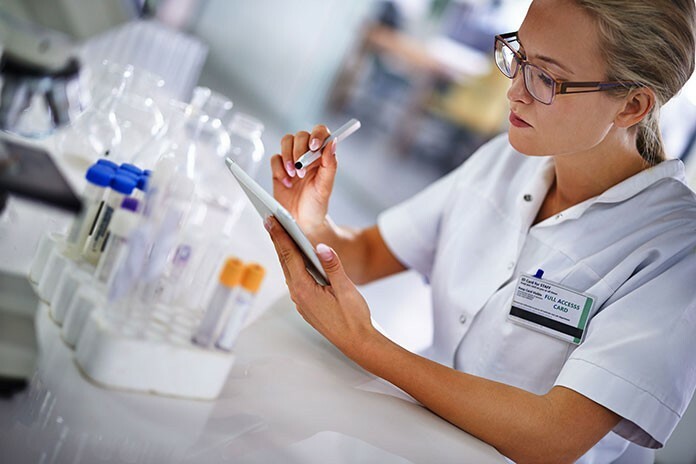 IBV is temperature sensitive and the samples for virus detection should be kept and transported at refrigerated temperature (max 4 °C) if delivered to the laboratory within a day. Otherwise the samples should be frozen at -20 °C and delivered to the laboratory as such. The first step includes detection of the IBV specific genome. Nowadays Real Time RT-PCR is widely used for this purpose, although classical RT-PCR can be used but with less sensitivity. These tests are based on detection of a conserved part of the IBV genome, usually 5’, 3’ or N gene. Most of the flocks that have been vaccinated with live IBV vaccine will give positive result even in absence of field virus, but Ct values in their samples are usually higher (meaning lower virus load) than in samples from birds with acute field infection. Therefore, positive samples with lower Ct should be used for subsequent discrimination from vaccinal strains and further typing of the field viruses. Moreover, samples with lower Ct value are more suitable for downstream molecular methods including nucleotide sequencing. At least one positive pooled sample from an organ type per farm should be genotyped. For example, in routine monitoring one pharyngeal/tracheal swab pool sample and one cloacal swab pool sample with lowest Ct values will be further analysed. This is due to fact that different types of IBV can be detected in the same bird/flock, but not necessarily in the same organ. Several IBV genotype specific tests have been developed, but their use is of a limited value, particularly if locally used vaccine is of the same genotype as locally circulating field strains. Vaccine specific molecular tests can confirm presence of a certain vaccinal virus, but the positive result does not exclude simultaneous circulation of a field strain within the vaccinated flock. Molecular tests that are developed for detection of specific field strains can be useful for monitoring and detection of only specific field strains, but either positive or negative results do not exclude circulation of other field genotypes. Furthermore, genotype specific test are prone to false negative results due to high nucleotide variability in primer/probe binding sites. Genotyping of detected IBV strains is based on the S1 gene, and it is usually done by classical RT-PCR with subsequent nucleotide sequencing of this gene. Sequencing of other genes does not give reliable genotype information. If possible, the entire S1 gene should be sequenced, although partial S1 gene sequences can be successfully used in general. There are no molecular markers identified for IBV pathogenicity so far, hence the interpretation is based on discrimination of the identified IBV from vaccinal strains used in the flock. If the identified virus does not belong to genotype of any vaccine used in the flock, the interpretation is usually straightforward and indicates field infection. Homology of the identified sequence with sequence of the used vaccine – the high homology generally indicates detection of vaccinal strain. In broilers and young pullets this homology is usually 100% or very close to it. The longer a period from vaccination to vaccine recovery, the greater is a possible accumulation of nucleotide substitutions in the vaccine virus. To our experience partial S1 gene nucleotide homology in recovered vaccinal virus from older layers/breeders can drop below 99% if compared with its original nucleotide sequence. This percentage is not a general rule since different vaccinal strains have different nucleotide substitution traits, and different parts of the S1 gene display different nucleotide substitution rate after circulation in vaccinated birds. Local epidemiological situation – if the used vaccine strains are of a different genotype from locally circulating IBV strains, high nucleotide homology between obtained sequence and vaccine strain sequence suggests that vaccinal virus and not field virus was recovered. Serology – significant increase of specific antibody titres, especially in older birds, will suggest detection of a field and not live vaccinal virus. In ambiguous cases, testing of ciliary activity in tracheal rings of experimentally inoculated chickens can discriminate between vaccinal and pathogenic strains. Such testing can be performed only in specialized laboratories and requires previous isolation/culturing of the detected virus. Finally, whenever new type of field strain is detected, virus isolation in embryonated chicken eggs or tracheal organ cultures should be attempted. Isolated virus can be used for detailed antigenic determination, in vivo studies of pathogenicity and cross-protection. The isolated virus perhaps can be used for a new vaccine development. Proposed testing scheme for monitoring of IBV circulation and prevalence is summarized in Tables 1 and 2. Criteria for considering of vaccine vs. field IBV detection probability in ambiguous cases of nucleotide sequence homology is summarized in Table 3.